The seemingly unseasonably cold spring has some things moving along at a pokey-molasses pace, others are all systems go. Our calendar and journal from last year tell us things are about a month behind 2017. Here’s a quick update as to some of what has been happening on the farm these past few weeks. We celebrated an exciting early greens harvest at the end of March. A few rows of cold-hardy greens we had started last fall and had hoped would overwinter and be ready for our earliest farm stand markets this spring started to bolt earlier than we had expected, became instead a special harvest for our early-to-sign-up farm share members. In the greenhouse, the germination chamber is stuffed to the gills with trays of soil blocks. The thermometer consistently reads at 70(ish) degrees in the germination chamber, an insulated and many-shelved box, with heat mats – temporary parking for seed trays while seeds are getting ready for their debut into sunshine. Shelves are filling up with flats of seedlings. Radishes are swelling. Spinach is getting mowed down by mice. We’re setting mouse traps with peanut butter. Outside and greenhouse temperatures have been such that we are still playing the cover-uncover back and forth game with row covers in the greenhouse, trying to keep all the little ones comfortable during the cold nights. One of the pepper varieties we seeded last week is La Mesilla – from our own saved seed. This is a Northern New Mexico chile pepper grown by our farmer friends and mentors, David and Loretta, at Monte Vista Organics. These two offer endless inspiration for us, not only as regards growing delicious food, but also as thoughtful, hardworking, generous and truly lovely humans. This just might be the very beginning of a Spearfish Valley, regionally adapted La Mesilla strain. Over half of the tomato varieties we’re growing this year are from our own seed (that’s 18/34, if you’re keeping count). Seeding in the spring is full of all sorts of hope and magic, wonder and possibility, all the things of poetry and prayer. These sentiments are amplified in planting seed that we’ve selected for and saved, seeing plants complete their life cycle, generation after generation, on the farm. And just a few more photos of April, above: a juvenile goshawk enjoying a Eurasian collared dove for breakfast (that was this morning! ); Halcyon in snow; the greenhouse disappearing under snow last week; lamb snuggles; spring eggs; soil blocking; spring greens; arugula+bacon+avocado+Jerm’s bread+fried egg = not our usual 13th century peasant slop(read: lentils) and thus a photo worthy feast; chickens enjoying culls from the greenhouse; baby kale (March harvest) and new harvest totes; Lady Eve Balfour; milk thistle seed; young ones in the gh; worm castings are all over the greenhouse beds; tomato seed. Thank you, friends! A special thanks to all who made it out for the Poetry Tour last weekend, we really enjoyed the time with you all. Greetings farm friends! Mark your calendar! 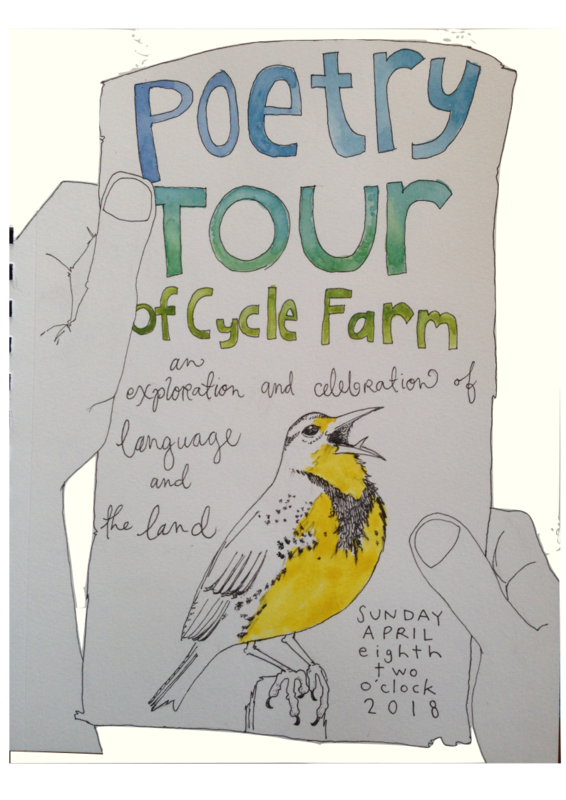 We hope you’ll join us on Sunday, April 8, at 2:00 PM for the debut of our lovingly created, carefully crafted poetry tour of the farm. In celebration of poetry and in concurrence with National Poetry Month we are introducing our Farm Poetry Tour, a walking tour of the farm accompanied by poems for selected locations. We have assembled this tour as a fun way to share the farm and our farming practices. The farm is a busy spot with lengthy to-do lists, having poetry scattered about encourages reflection and thought. We love to share the farm, to help build connections between people and their food, and to build connections between people. Art and poetry provide a platform for shared experience, and with shared experiences we have something in common over which we can relate. In the poetry tour guide, each poem is followed by a few of the many reasons why we are excited about it and have chosen to include it on the tour. We look forward to spending a full year with these poems on the farm and sharing them with you. Over the holidays we had a chance to visit with good friends who recently opened a fantastic brewery in Northfield, MN. In catching up on news of their new venture, they relayed accounts of all sorts of creative community building activities they have been engaged with via their new local business. They host live music and taco carts(etc), help find foster homes for a local animal shelter’s featured “Brewery Dog of the Month”, they partner with local farms for fine, fresh ingredients (a blueberry wheat, honey basil ale and something amazing with rhubarb and raspberry), AND they have been hosting poetry nights at the brewery, and even present patrons with poems printed out and displayed on the back of the bathroom stalls. Poetry at a brewery!? Brilliant! This caused us to think: we need poetry on the farm. So, with a suggestion from Jeremy – a poetry tour of the farm – we immediately set about compiling a selection of poems from our most favorite poets and poets we didn’t recognize. Poems that spoke to us and our community, the farm and the work we do here. We unloaded our book shelves of all poetry books, and anything else that had poems tucked in corners, at the beginning of chapters, almanacs, calendars, and cookbooks too. For three days, the living room floor was covered in a glorious pile of literature. We sat together, quietly reading – interrupting each other suddenly and sporadically to read new-found favorites aloud. Half-way through the third day of binge poetry reading, we decided we had better wrap up the list, compile the tour and be done with it – or it we’d still be sitting here reading come May. Pulling these poems together was huge fun. Derek and Laura, thanks for your inspiration. …and while you are cavorting about reading poetry and getting to know the farm – keep an eye out for the new birdhouses that have sprung up around the farm. Birds have been scouting them out, but we don’t know of any nesting just yet. 4 people biked to the farm – with pies in tow (3)! 1 brand new pie – Excitement Pie! What happens when you take a Chocolate Silk pie on an exceptionally fun two-wheeled journey to the farm? It becomes Excitement Pie – the most delicious thing in, and out of, a pie shell you’ve ever eaten. Infinite, amount of joy and gratitude felt by these two farmers. A note on the pie phylum chart: Jeremy thinks they are actually orders. I’m pretty sure these are phylum and I like the way it sounds. Either way, it’s a kingdom of pie and that’s pretty rad. We grow scallions, scads, succession planting for continuous harvest throughout the season. Fresh scallions are amazing, delicious, they are easy to use, in everything. So we grow a lot. Evergreen Hardy has become a favorite for both flavor and vigor, and we’ve been saving seed every other (ish) year. We haven’t yet invested in seed sieves and as a result we’re still working on a way to adequately and (time) efficiently clean our onion seed. I broke the flowers off the stems and tossed everything around pretty vigorously in order to make sure the seed was good and out of the flowers. Then, handful at a time, I dropped the seed and chaff into a jar and topped it off with water. The chaffy nonsense floated to the the top along with junky seed and the good seed when right to the bottom. I used a chopstick to stir this around a bit. Decanting a few times left me with a bunch of beautiful seed at the bottom of the jar which I immediately spread out to dry. Quick. Everything expeditiously. Jeremy opted for dry winnowing. Using the two sieves we have (a pasta colander and a smaller, mesh strainer) he skimmed off the big chaff and removed the smaller dusty bits. We use a box fan for winnowing kale, beans and corn – but the onion seed requires a more gentle air current, and one can only do the “blowing birthday candles out” seed winnowing technique for so long before becoming too light headed to continue. So we made a cleaning tool that friends at Meadowlark Hearth introduced us to. A sheet of fabric wrapped around a frame. With this we were able to tap the onion seed away from the stems – real slick! This frame is a great way to clean round seed like brassicas and beets, and we are happy to report: it works well for onions too. Here’s a short video of 1000 onion seeds bouncing on a bedsheet, accompanied by Kid Koala. Both methods seem to yield equally clean seed. Water-winnowing went faster. Dry winnowing was less stressful. We’ve kept seed from these two methods separate and we’ll try them out in side-by-side plantings to compare germination rates over time. And a special note for all our fellow Spearfish Seed Enthusiasts: next Sunday (3/11) is the Spearfish Seed Swap from 1:30-4:30 at the Spearfish Public Library. Come, bring your seeds and your friends, bring home your friends’ seeds! We’re celebrating FIVE years! Even if you don’t have seeds to swap, come anyway, join with friends and neighbors for an afternoon of gardening camaraderie! Hooray-hooRAY and happy, happy tidings! One of the exciting things about flipping over into another January is starting a whole new series of calendars, and we have no shortage of these: farm journal, planting calendar, daily planner, and our bird list. We started the bird list last January 1st in an effort to better monitor our avian diversity and as a way to record the comings and -especially- goings of migrating species, of particular interest: the robins and vultures. The calendar is set up by week with a note (x) for observed presence on farm during that week. This doesn’t account for number of individuals. 300 Grackles get the same x as one Rufous Hummingbird. However, this does show number of species and trends over the course of the season. The boundaries we use for inclusion are not rigid. Fly-overs are counted as “seen on the farm” (i.e. Sandhill Cranes, Mallards), however wild turkeys seen parading about in the neighbors’ horse pasture don’t. To an extent, these boundaries follow Jeremy’s whims and fancies and mostly depend on likelihood of direct interaction with the farm. With these records we can see the two peaks (mid-May and Sept-Oct) of spring and fall migrations. It looks like the spring migration peak is a shorter pulse as birds are cruising on to breeding grounds, and fall migration is more drawn out. Over the course of the year, Jeremy got a whole lot better at bird observation and identification. This certainly skewed the data a bit towards fall abundance. Our original list included 82 species that we thought we had seen on the farm over the past 5 years. This year we were able to confidently identify a total of 103 different species including 35 new-to-our-list species. (HOLYCRAP!) Bird highlights: We identified three species of hummingbird including the smallest bird in North America, Calliope (photo above(!) courtesy of Greg Albrechtsen). A Golden-winged Warbler. American Redstarts nested here. Regular visits by a Great Horned Owl. Our first Orioles. AND we learned to identify several of the warblers (at least 11 different species and variants), who had until this year just been lumped as “the little flitty birds in the trees.” It’s fun to have these visitors to the farm, to be aware that they have come through, but the species who make the farm their home are most intriguing to us. We are having big fun getting to know the behavior and personalities of these birds; the Juncos, Robins, Starlings, Blue Jays and Flickers. Our biggest bird week (9/10) included a Sunday in which our sweet, smart friends, Greg and Mary Beth, came over and spent the morning birding with us. These two have been generous and contagiously enthusiastic mentors for us as we cannonball (bellyflop?) into the deep-end of the pool of birding. We’re especially excited to continue this monitoring and watch how seasonal trends appear over several years. And this year we will be planting even more Hummingbird Sage and Sunset Hyssop. Big cluster plantings, everywhere. It’s snowing and we’re tucked in. Piles of books by the end of the couch, tea kettle spitting, we’re thoroughly nested in woolly things. We are reflecting on this past year and beginning considerations for next season. This year brought a number of changes to the farm: a new CSA market model, a nearly completely functional packshed, fewer than planned prepared and planted rows, our first hired farm hand (yea, Madeleine! ), and a new mural. In preparing for the construction of our packshed area, last spring (2016) we moved our walk-in cooler over to the south side of the garlic shed (‘garlic shed’ – currently a catch-all glorified junk drawer for wood working tools, bags of clean sawdust for nesting box bedding, and where we hang garlic to cure in the summer). The walk-in is an 8’x8’ insulated box cooled with an air conditioner and Cool-bot; the outside walls are cedar sheeting. A perfect spot for art. Big art. Last season was spent pipe-dreaming mural ideas as we walked back and forth by the empty, exposed wall of the walk-in cooler. Vegetables and bicycles. Heaping baskets of vegetables. Butterflies and bumble bees. A giant lacewing. A schematic of the carbon cycle. Sunflowers? Lots of sunflowers! We schemed mural ideas. …but why duplicate something on the wall that already grows right here, something we see routinely? In the end, we decided that we needed something far removed from the daily activities of the farm, but something we are still connected to. The decisions we make here and our land management practices effect habitat and ecosystems far removed from our immediate farm. We are super far away from the oceans and yet, in not terribly obvious, ittybitty ways and profound, undeniable ways, we’re connected. We are trying to grow good food as a means of working towards greater goals, a stronger community and a healthier planet. And so, we decided the farm needs an octopus. On the surface, we are radically different creatures, us and octopus (underwater invertebrates, eight legs and a beak(! ), chromatophores (!?). Completely bizarre in every way). However, octopuses embody characteristics that we are inspired by and strive for in our farm management. They are intelligent, cognizant, and interactive. They are problem solvers. Curious. Adaptable. Flexible. Resilient. Strong, yet vulnerable. Playful. Emotional. Observant. Deliberate. They are ecosystem engineers, able to shape their community and benefit other species beyond themselves. Despite limited experience with oceanic invertebrates, our friend Rebecca graciously agreed to paint an octopus for us. Over the course of a few weeks, she came out to the farm and set to work. The October bright blue weather had her melting against the south-facing wall some days. And, on other days, we helped rig up a tarp shelter and space heater in order to help keep the paints – and Rebecca – from getting too cold. Over these days we had the chance to watch the transformation from featureless cedar surface to near-animate being. A sketched outline projected on the blank wall became chalk. Then a bright blue silhouette. Turned orange. And an eye! Then suckers. Rows of plain white circles became many-hued dimpled orbs of early sunrise, each its own magical oystershell of pink and purple, blue, but still white. It’s no longer an it. She is an octopus. She is intricate and vibrant. She welcomes conversation and reflection. I think her name is Halcyon; Jeremy’s not so sure. Her presence is a nod to our own beloved, hand working, and omnipresent farm invertebrates. She makes us feel like we had better do a good job. She is a reminder of what we are working toward. We feel honored to have this beautiful piece on the farm. The thoughtfulness, creativity, generosity, and love that went into her creation are an inspiration to us. Thank you for sharing this gift, your gift with us, Rebecca. P.S. A couple additional comments of note: Jeremy’s father, Dave, pointed out with great mirth, it’s an especially apropos totem for the farm. And Papa Jenkins thinks this is clearly a sign of our good taste. 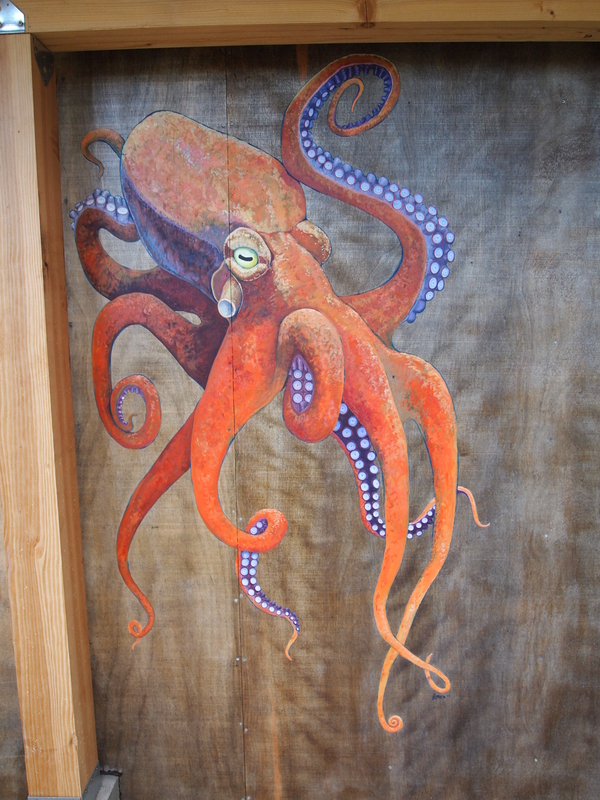 We have since discovered that there is a history of octopus murals in Spearfish, or at least one other. A mid-summer photo dump. Annotated. In full. The corn-beans-squash beds have exploded and are running amok through the rhubarb, climbing the greenhouse. You can almost watch the Rouge vif D’Etampes and Sundream swell. The beans we have planted in here are Hidatsa Shield Figure beans and the corn is a Taos Blue Corn that makes scrumptious atole and pancakes. We also planted in a few of the lesser known fourth sister, Rocky Mountain bee plant (cleome, spider plant), but it seems she may have been swallowed by her siblings. The sisters are planted in two beds near the greenhouse, it’s a small planting and we may have to hand-pollinate the corn. We have 8 additional rows of various winter squash varieties planted, but didn’t get our popcorn or other dry beans in this spring. We’ve teased out a 4-year crop rotation that’s been working really well for our staple crops; potatoes then squash then beans then either garlic or popcorn. The field winter squash were seeded into alternating beds with our garlic planting. Garlic was harvested out in mid-July and Jeremy immediately seeded a buckwheat and oat cover crop in its place. Despite getting this seeded just before a good rain, the cover crop is really doing best near the drip lines. With the garlic out and the buckwheat/oats just getting going, there’s plenty of room for the squash vines to spread. We’ve been playing with integrating different cover crops and mixes with our vegetable plantings, some we haven’t mastered so well. This is one that we’re especially pleased with. Jeremy has been spending more and more time ooey-glueyied to the binoculars. The bird list is up to 87 different species identified on or flying over the farm this year. Most recently: Shrikes hunting grasshoppers in the orchard, a Red-eyed Vireo, hummingbirds (Ruby-throated and Rufous), a Great Horned Owl, Orchard and Baltimore Orioles, and a Lewis’s Woodpecker. We continue to lose young trees to voles – usually they get girdled during the winter, but this summer we’ve lost several, probably due to tall grasses near the trees (sounds like we need some lambs again, eh?). There have been a few fruits this year, mostly apples and plums. Noteworthy fruits include a plum from the very, very first tree we planted on the farm, a pear from a tree planted in honor of Grandma Ginny, and a bomber crab apple harvest which we are currently climbing through the middle of. Oh yes! Even berries off of our brand spankin’ new, first year hedgerow shrubs (many thanks to those fine folks at the Lawrence County Conservation District). We planted over 200 bareroot cherries and berries around the perimeter of the orchard, immediately got them linked up to a drip line, and they’re doing great. This (below) is a shot of one of the hummingbird visitors we’ve had on the farm during these past few weeks. Most activity has been seen on Texas Hummingbird Sage and Sunset Hyssop. A young female Rufous Hummingbird, photo by Greg Albrechtsen. This season, we’re experimenting with a new farm share market plan and we’ve received good feedback from our farm stand family members. It’s sounds like there is significantly less food waste happening at customers’ homes and folks are appreciating the choice in produce and the flexible schedule. We’ve noticed that we have a much reduced stress level this summer versus previous summers. And at least part of this we are attributing to our new marketing arrangement and how it is reducing our stress around filling bountiful and balanced CSA baskets. Some of our worries with this new arrangement were losing the connection to the farm that a CSA membership facilitates and that a market style farm share plan might force us into growing only just the most popular vegetables. A carrot and tomato farm. These were unwarranted worries and we’ve found that, overwhelmingly, our customers are staying engaged with the farm through emails and newsletters, coming throughout the whole season, and are still trying new vegetables and supporting the farm by purchasing a diversity of vegetables. We really appreciate our thoughtful community of farm supporters, they’re truly helping make this all possible. We’ve been having fun getting to know new flowers this year, both new-to-us annual varieties and several perennials that are only now setting blooms. Blue vervain, elecampane, lemon bee balm/bergamot, liatrus, hyssop, black cohosh, chocolate flower, Buddha’s Hand cosmos, butterfly milkweed, some crazy pink poppies, and arnica. We’ve also been having fun getting to know our native pollinators better. This spring, we built a native pollinator nesting box. It’s outfitted with oat straw, sunflower, Valerian and chicory stems. Drilled holes of various diameters and depths. Nesting sites for all sorts. The box is set up near the farm stand and new pollinator/herb bed. It’s a busy spot and completely captivating. We have identified several: grass-carrying wasps, yellow-faced bees, leaf-cutter bees, mud dauber wasps, mason bees. And then there are all the ones we haven’t identified: tiny metallic blue bees, yellow-bellied bees, etc. It’s become a regular farm telenovela series. Return characters. Romances. Dark relationship dramas. A leaf cutter bee who lined and capped her nest with flower petals. A yellow-faced bee who robbed the saliva from one nest to build another. Earlier this week, we saw a Downy Woodpecker take off from near the box. When we inspected the holes, we found them littered with green leaf-cutter bee nest confetti. This bird had found the buffet line and loaded up. If it’s any consolation, we’ve read that mother bees will lay female eggs at the back of the nests, and male eggs towards the front.. for this very reason. If you’re as stoked about native pollinators as we are (and why wouldn’t you be? ), check out the Xerces Society, a great resource on invertebrate conservation, pollinator box worksheets here and here. Peek inside the solitary bee nests here, Resonating Bodies, and lastly here’s a neato video. The pollinator box has been so popular – with both invertebrate friends and people friends, that we hosted a native pollinator nesting box building workshop. It was a treat to spend the afternoon with fellow pollinator-enthusiasts, being constructive and creative together, building habitat for our beloved native solitary bees and wasps. Eight solitary bee boxes were constructed and are now up, scattered all around the Spearfish area in home gardens and backyards. In an uncanny yet completely obvious and timely expression of gratitude, we all watched, amazed, as a bee headed right into one box even before it’s roof was attached. This year, the front field is planted in alternating rows of beans and potatoes (with a few intercropped beets and a row of fall brassicas). We are intercropping more this year than we have before, mainly due to space limitations. The limitation is not overall space, but ready-bed space. This season we have a lot of beds that are unplanted, 40% of our designated rows never got weeded and planted this spring. However, we’ve been putting time and money (via paid labor; thank you, Madeleine) into pulling rhizomes and getting this space ready for next year. Below is a view of some of the beds in the back field. From left to right: fennel in flower, lettuce, just germinating fall carrots, beets and tomatoes, peppers, more tomatoes, (and just out of view) cucumbers and cabbage. Bottom left, celery seed drying. We just learned that when celery plants go to seed they become ginormous. Don’t try and grow anything near them, because you won’t. Beneficial insects are all over the flowers though. And you can smell the heavenly celery from halfway down the field. Immediately after clearing a bed of lettuce(some) and celery(mostly), we added compost and seeded in carrots. (Specific no-till bed prep methods: pulled out lettuce, cut celery stalks at the base, seeded carrots using precision seeder / 6 rows, replaced drip tape, shoveled on compost, just a thin layer, raked gently to even the bed, hand watering with hose daily until germination, approx 6 days.) We’ve been having trouble with carrot germination, but these little ones look great and will be a welcome addition to roasted root vegetables and fall soups. After three years without much for apples, this year, trees are super heavy with fruit. So far, we’ve collected over 200 pounds of crab apples from the tree by the farm stand. Most of this will be pressed and fermented into hard cider (Naked Lady Crab Apple Cider, 2017 vintage – harvest coincides with blooming Naked Lady flowers), plain wild ferment and a dry hopped batch. At least 200 hundred more pounds have be raked up off of the ground for our chickens and the robins and doves have probably eaten that much as well. The tree still looks loaded. (Interested in pressing cider? crab apple jelly? pickling? let us know.) The wild plums have their biggest crop in the six years we’ve been here. We seem to have three varieties of wild plum (red, yellow and purple) of which we have only picked one so far, but the rest should be ready to pick by the end of the month. And the grapevines have a good crop as well. We use a refractometer to measure the sugar level of the grapes, and we start harvesting when they get up to 20-22 degrees brix. Harvesting grapes is not infrequently interrupted by shrieks, squeals, and big happy laughter as we find young garter snakes four feet off of the ground, looking at us eye-to-eye while we’re reaching for clusters of fruit. As the busy planting and weeding season passes the baton, clumsily, into busy harvesting season, we have found just a little time to sneak in infrastructure and other construction projects. Finishing the wash/pack shed is moving up in priority on the to-do list. We have spent the summer testing out different arrangements of the wash area layout and are nearly ready to commit to running water lines, lights and electricity and building out sorting tables and shelves. Earlier this week, we built a hand washing sink. It currently has a spectacular view. Also on the pack shed construction to-do list is a pair of sliding barn doors to enclose the north and west sides during times when inclement weather and harvest coincide. And, quickly and best of all, our friend Regina came for a visit, the sun went away then came back, and we received an award for Conservation Citizenship from Lawrence County Conservation District(!). Volume 5! It’s time for our annual summer mixtape love letter to the farm (inspired by a mixtape love letter to the parks that birthed hip hop).This special compilation of agrarian beats has been assembled as a reflection of our season thus far. Many thanks to our friend Tom and the esteemed Kid Hops for inspiring good grooves, and to the artists who honor food, farmers, and the land through their music. For more listening, check out our previous agrarian riddims compilations: Volume 1, Volume 2, Side C, and Volume 4. The Agrarian Riddims mixtape, Volume FIVE is available to stream on a youtube playlist here. Or tune-in to individual tracks below. In celebration of National Moth Week (coming up: July 22-30th) and our fine nocturnal Lepidoptera friends, we hosted a Moth Party on the farm this past weekend. We strung up a white sheet on the laundry line and spread another out on the grass. 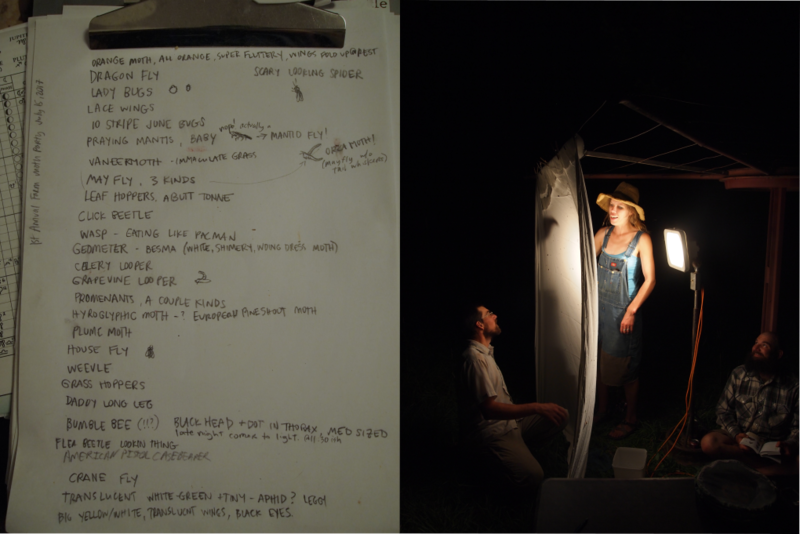 Dusted off the chicken brooder lamps and lugged out our loupes and helpful (and less helpful) moth identification guides. And watched the happenings. It was captivating and incredible. And super fun. 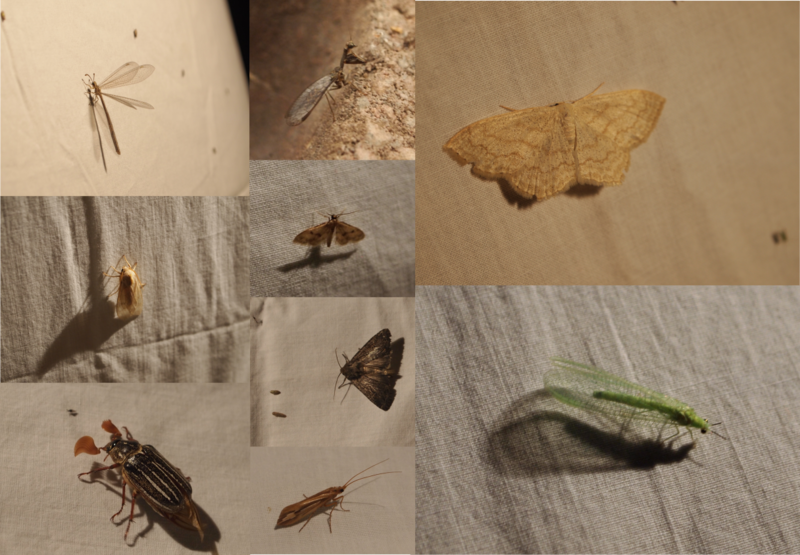 Here are photos of a few of the moth party attendees: (bigger! click on this image) So much more than moths joined the party. Special surprises include lady bugs, a bumble bee, dragon fly, and a mantid fly(!). Swarms of itty bitty leaf hoppers. Some spiders. Lacewings(!!) And a wicked smart wasp who spent the evening cruising up the illuminated sheet eating everything in its path, like Pacman. A bzzzillion thanks to our friend Jane, a brilliant and enthusiastic young naturalist and coolest middle schooler we know, who came equipped with her own butterfly net and observation cage and helped us all with the evening’s invertebrate identification. This is a clover looper who has worn scales of her (his?) thorax, likely from wedging into flowers, under leaf litter, behind bark, or other tight spots. Crack climbing the farm. Farm nightlife is hoppin’. Thanks to everyone who came by and joined us in appreciation and admiration of all these little critters. We’re already looking forward to the next Moth Party. P.S. We originally schemed projecting Mothra on a second screen (which attracts more moths: white light or Godzilla vs. Mothra?). Due to poor time management on the farmers’ part, we didn’t get the VHS/projector/screen set up as planned. Our apologies for this. Next time. This summer we’re taking a break from raising pastured meat birds and lambs and instead, we’re devoting all our coochiecooing attentions to our laying flock. We have Ameraucanas, Black Australorps and one sweet Dominique (barred bird in photo above). The Ameraucanas lay blue-green eggs, the Australorps and Dominique lay various shades of brown eggs. In the past, we’ve ordered straight-runs of chicks as mixed grab-bags of heritage breeds from Sand Hill Preservation Center. We’ve had great luck with their chicks and through these birds we learned a lot about different types of chickens, good layers, not so good layers, growth rates, behavior, egg color, broodiness, comb-size and frost bite susceptibility, etc. And we enjoyed the variations in egg color. However, in replacing old layers, we found it hard to distinguish between the newer layers and old hens. With the cost of feed, our profit margins on eggs are such that we can not afford to feed good sweet birds who are not laying eggs. Finally, after 4 years, egg production had become an economic folly and we decided to refresh the whole lot. Instead of ordering the mixed bag of heritage breeds again, we took a cue from our friend Julie at the James Ranch in Durango and decided to select birds by breed, such that we can establish an easier flock rotation. New layers this year are distinct (the Australorps are solid black, the Ameracaunas are either brown or white with mutton chops), the next chicks we get may be white or barred birds so we can tell the difference in age. Our 43 hens spend the day patrolling for bugs, grubs and tender green things through our back grapevines. They dust bathe and rest in the shade of the spruce trees. We lug weeds out of the field by the bucket-load for them to manage. Periodically throughout the summer, we’ll let the open ditch run to water the trees; the birds always seem to enjoy an afternoon of puddle jumping and muddy worm gobbling. They eat things all day, lay eggs, and make great noises. And then they pick on each other and get broody and make even better noises. Currently we are ordering in feed from Buckwheat Growers, an organic feed mill in Minnesota. We order whole grains and use a small mill to grind grains, then mix the feed ourselves. The mill allows us to grind feed weekly, ensuring freshness and high nutrition. We are trying to find a more local source for these grains and ideally reduce our shipping costs as well as carbon footprint. We’re grateful for these feathered ladies, for eggs, nutrient cycling, and entertainment value.